Every once in a while, even the classiest man desires something a little more casual to fill the void, which is why Robert Goulet also owned many mock turtlenecks. 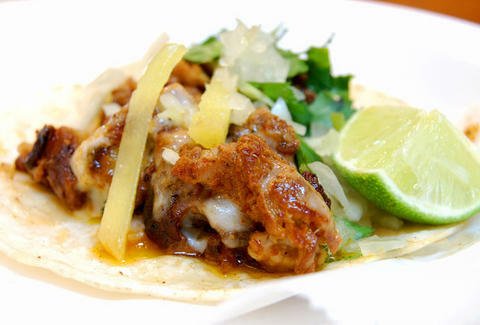 For a little taco shop bringing that to the Grove, hit El Taquito. Run by a Mexican wife and her Cuban husband (who lived in Mexico City for 11 years), Taquito's a tiny, easy-on-the-wallet counter service spot filling the quick-/inebriated-food void in the French/cafe-heavy Grove, situated within stumbling distance of tons o' bars, and rocking taquería eats from Mexico's central region, which will undoubtedly enhance your own. The menu's foundations are the small tacos, including the De Cecina (thin slices of marinated beef), skirt steak, combos like chicken/bacon/pepper/onion, and pork variations like roasted carnitas and Al Pastor, where the pork is cooked on a gyro spit, covered in pineapple, and served with pineapple strips, which're almost guaranteed to turn into a pineapple lap dance. To keep eating, there're enchiladas like the Suiza (w/ Swiss, chicken, ham, or pork inside) smothered in cheese and mild tomatillo sauce, a dish called the Sincronizada (basically a grilled ham & cheese sandwich with whole wheat tortillas for the bread), and quesadillas including the deep-fried Taco Crispy (part of this complete desayuno). They've got some cool juices, too (fresh-squeezed pear, watermelon, mango, and cantaloupe; milkshakes with said fruits), Jarritos sodas like tangerine, pineapple, and grapefruit, and Sangria Señorial, which is essentially a sweet sangria, but in virgin form -- a drink that obviously doesn't believe in filling the void.